IMMORTALE DEI (On the Christian Constitution of States) Pope Leo XIII Encyclical of Pope Leo XIII promulgated on 1 November 1885. "I want the whole world to know My infinite mercy. 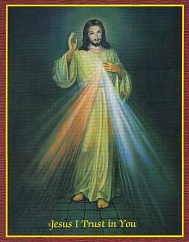 I want to give unimaginable graces to those who trust in My mercy." Out of the 3 well known monotheistic religions, Christianity is the true faith. It is an extension of Judaism, in that the long awaited and promised Saviour is realized. When Abraham was ready to not even withhold his own son (Isaac) when stopped by an angel of the Lord, he looked around and saw a ram caught by its horn in the thicket, to which he was to offer as a sacrifice instead (Gen. 22:12-18). This of course is a foreshadowing of our Lord Jesus Christ (lineage - God and the tribe of Judah), THE ONE TRUE SACRIFICE who was sacrificed for all our sins, and to which He patiently endured a crown of thorns on His head (horn - thicket; head - crown of thorns). But of course, the whole Old Testament (the law and the prophets) is about Jesus Christ. The New Testament is the Saviour and promise realized. Jesus Christ always existed; Islam came from a man in the 7th century. Sikhism didn't begin until the 15th century by a man. Christianity on the other hand, was started by God. Since Judaism transitioned into Christianity, it is the only enduring religion that was started by God! Many Jews converted over the past 2000 years. I graciously implore you to reveal to me the Truth. What about all the injustices done in the name of religion, you ask? Well, I can tell you God is not to blame. You can blame our free will, sin and some of the choices we make; and the devil - but no, not that charming Lucifer guy on primetime TV. And while it is true that men through the centuries have done evil things, even under the guise of Christianity, it is also clear that our Lord's two most important directives are: love of God, and love of each other. It is unGodly to be averse to either. Christ is the Prince of Peace. Remember, the devil lies, deceives, creates division, pits brother against brother, and even garners sympathy from those whom he deceives - thereby furthering his objective - which of course is to drag us to hell with him. We were never promised happiness in this life - but in the next. We make sacrifices in this life to achieve eternal happiness in the next. Know and understand this: Christians have been, and always will be, the most persecuted group on earth - until the end of time. Over 70 million Christians have been martyred in past 2000 years. 40 million of those in the 20th century alone! Christians, especially Catholics, have and will be, persecuted until the end of time. But why are there so many different sects of Christianity? For a few reasons: The devil is always waiting to overrun individuals... even Martin Luther, who may have been Pope in his day. Martin Luther is the father of Protestanism. Keep in mind: God started the Catholic Church, and promised that it would endure... to the end. God never breaks a promise! Oh, and by the way, the Holy Bible is a Catholic book. Another reason is cause and effect. People, even the clergy, expose themselves to evil, misdirection, and division when they sin. The devil of course is always trying to trip up and tempt those who follow Christ, especially His ministers. For those who don't follow Christ, the devil already has them. And even the Apostles had disagreements, but came together. Political, cultural and doctrinal differences have divided the Church as well. So you want proof there is a God and that the Catholic Church is the true Church? In John 14:11, our Lord even said that if you don't believe in Him, believe in the things He can do. That is why God (God the Father, God the Son, and God the Holy Spirit)** performs miracles. Miracles in the Old and New Testament; Marion apparitions; Eucharistic miracles; miracles done by God through the saints; miracles happening all through history and even today. But miracles aside, you have to have faith, trust in the Lord, and remain vigilant, because this valley of tears, and the devil, will try to erode it and attempt to turn you against Christ and the hope of salvation. However, miracles can be our anchor, and strength when faith is tested. NO OTHER RELIGION HAS THESE MIRACLES AS WELL AS THE SUPERNATURAL AND MIRACULOUS THINGS DONE THROUGH THE SAINTS - BY OUR GOD TO PROVE HE IS THE ONE TRUE LIVING GOD. The year 2017, the hundredth anniversary of the miracle of Fatima. In a superb, divine twist, God performs an amazing miracle in a place that shares the same name as Muhummad's favourite daughter. A name which also means "peace". Tell me that wasn't for nothing! It shows that God's methods and timing are impeccable... always, and that He (through the Blessed Virgin in this instance) is calling all people. Also, find out what happened in Mexico in 1531 (conversion of millions) and the miraculous image of Our Lady of Guadalupe (a woman clothed with the sun and a crescent moon under her feet! ), and much, much more! God, for the most part, will not force himself on anyone. He wants people to come to Him on their own free will (it is their choice). For a person who doesn't have a choice, he/she is already enslaved. But Jesus can free them, if they ask Him. If you open the door, even a crack, He will quietly pursue you, patiently waiting for YOU TO BE READY. Not for Him to be ready, but you. He is always ready, and will incline His ear to even the slightest invitation. You open the door by praying, inviting God into your life with a sincere will to change. He will do this, even though He owes us nothing... because He didn't even withhold His own Son*** for our sake so that we may obtain eternal happiness with Him in Heaven. Remember: there is no future here on earth; we are just pilgrims here for a short time, on our way to somewhere else. Our true home is in Heaven. But until then, no matter who you are, where you're from, or what you've done, the Catholic Church is your earthly home. The Church is inclusive and is everyone's birthright! Do Christians, Jews and Muslims pray to the same God? CCC, 841 states: The Church's relationship with the Muslims. "The plan of salvation also includes those who acknowledge the Creator, in the first place amongst whom are the Muslims; these profess to hold the faith of Abraham, and together with us they adore the one, merciful God, mankind's judge on the last day." Muslims don't believe in the Triune God, or Jesus Christ as the Son of God. The Jews believe in the God of Abraham, but not Jesus as the Messiah. In the first century, and all through history, Jews have converted to Christianity. Others, however, believed at the time, that the Messiah would come into the world in all his splendor and glory as a powerful king - certainly not as a vulnerable, helpless little baby, born to two apparent nobodies who were poor. But as Saint Paul reminds us, Jesus was born among the poor to show us that true riches are to be found in him. A blessed irony if you will. But Jesus fulfilled ALL promise and scripture. Keep this in mind: you cannot reject Jesus Christ and expect to be right with His Father. * Lineage: "...your wife Sarah is to bear you a son, and you shall call him Isaac. It is with him that I will maintain my covenant as an everlasting covenant and with his descendants after him. Now as for Ishmael, I will heed you: I hereby bless him. I will make him fertile and will multiply him exceedingly. He will become the father of twelve chieftains, and I will make of him a great nation. ** We can never fully understand the mystery of the Trinity, but we can sum it up in the following formula: God is three Persons in one Nature. The three Persons of God—Father, Son, and Holy Spirit—are all equally God, and They cannot be divided. The Holy Spirit proceeds by an eternal procession from the Father and the Son. Even though the Three Persons are One God, yet they are distinct: for the Father has no origin, He came from no one. But the Son is begotten, He comes from the Father alone. The Holy Spirit comes or proceeds from both the Father and the Son. These different relations of origin tell us there are three distinct Persons, who have one and the same divine nature. Even though everything the Three Persons do outside the Divine nature is done by all Three, yet it is suitable that we attribute some works specially to one or the other Person. So we speak of the Father especially as the power of creation, of the Son as the wisdom of the Father, of the Holy Spirit as goodness and sanctification. *** Son: Abraham did not have to sacrifice his son Isaac; but God sacrificed His only begotten Son.